The best of both worlds: private location next to the woods, and easy access to the pool and hot tub at Mountain Harbor. 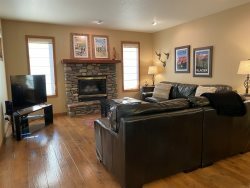 This condo has hardwood floors on the main level with a stone gas fireplace in the living room and sun lights in the vaulted ceiling for extra light. The master has a king bed and private bath. 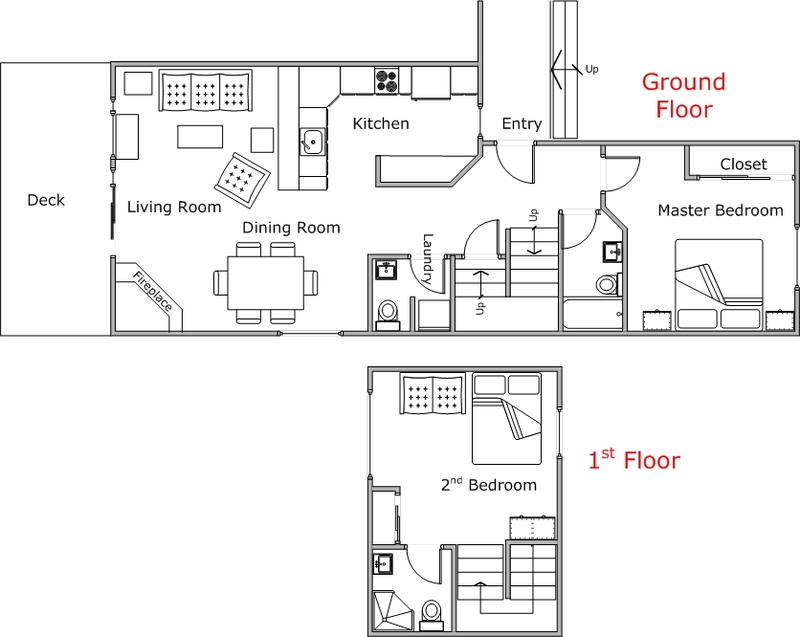 The upstairs enclosed loft-style bedroom has a Queen bed, pullout twin bed and private bath. The kitchen is fully equipped with pots, pans and dish ware. Loft bedroom has a portable air conditioning unit. Mountain Harbor is in a great location on Whitefish Lake; only 6 miles from The Whitefish Mountain Resort for Alpine and Nordic Skiing in winter or in the summer enjoy hiking, mountain biking, zip lining and Tree Top Walks. A 2 mile walk on the new footpath/bicycle path is a very popular way to access Downtown Whitefish for a morning coffee or breakfast at one of the many local restaurants.Whitefish has a variety of dining options from sushi to steak! You can view our Top Picks by visiting our Local Area Guide for staff suggestions on things to do and places to eat and don't miss visiting Glacier National Park, a short 35 minutes away from Whitefish with all the hiking, biking, water rafting, fly fishing and family fun you could ever dream of. By far one of finest places we've ever stayed. Absolutely stunning! We enjoyed our condo. Exactly as advertised. Everyone I dealt with at MH were knowledgeable, professional and attentive. My only comment would be to have a tea kettle and/or hot water kettle for us "Tea" drinkers. Great facility and beautiful condo! We will definitely rent from Lakeshore Rentals again. Thank you for a wonderful time!